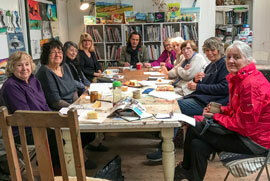 We are are a group of 30 artists in the Edenbridge area, we came together in the summer of 2008 and founded EVA. We aim to attract professional and semi professional artists living / working in the Eden valley area to join our group. EVA is a voluntary non-profit making organisation. We aim to achieve this in a variety of ways including holding forums, networking gatherings, exhibitions and art events in the community. We have a broad range of talented artists in the group working in mixed media, paint, glass, sculpture, textiles and photography. We also have an EVA Facebook page - please have a look and 'like' us for your EVA updates. More news soon on our plans for our annual exhibition and Autumn art and craft fair. We have a wonderful time at Jessops Gallery taking part in a watercolour workshop. 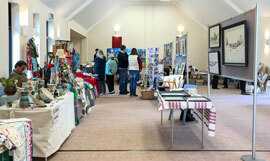 In November we held a successful art and craft fair at the wonderful village hall at Chiddingstone Causeway.